Thoracic disc herniation occurs when the disc between the vertebrae in your thoracic spine (trunk) bulges, pushing on the spinal nerves as they exit from the spinal cord. Herniated discs in this region of the spine are much less common than the cervical spine or lumbar region. Herniation of the thoracic disc most commonly occurs in people between the ages of 30 to 50. How does a herniated thoracic disc occur? 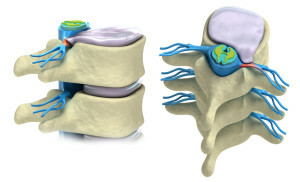 Between each of the bones in your spine (vertebra) there is an intervertebral disc. This disc provides shock absorption and allows freedom of movement in your spine. A herniated thoracic disc occurs when the central, jelly-like portion of the disc (nucleus pulposus) protrudes through the tougher outer layer (annulus). The bulge that is formed can then put pressure on the spinal nerves, and sometimes on the spinal cord itself. In the thoracic spine, the vertebrae are attached to the ribs – the support given to the spine by the ribs is the probable reason why the incidence of herniated discs in this region of the spine is so much less common. People who have a herniated thoracic disc very commonly have one or more disc herniations in other areas of their spine as well, pointing to a congenital link. What are the symptoms of a herniated thoracic disc? If the disc herniation is pushing on the spinal cord (spinal stenosis), you may also have some loss of bladder or bowel control. Like in the cervical and thoracic regions, a herniation of the thoracic disc can sometimes cause no symptoms at all. What is the treatment for a herniated thoracic disc? The first line of treatment is conservative. Your doctor may prescribe medication, or refer you for physical therapy treatment. It is really important to keep active and physical therapy may help to manage your symptoms, improve your mobility and strengthen the muscles around the affected area. Most people with this condition will have a good resolution of their symptoms within a few weeks to months. For some people, surgery is necessary. This is especially the case if there are symptoms of the spinal nerves or spinal cord being compressed. Your surgeon will discuss with you the best surgical approach for your particular condition. Most people will fully regain their pre-injury activity levels and have a good reduction of their symptoms after surgery but it is important to note that surgery is not able to completely take away pain or other symptoms for all people.